After barely escaping a trial for a murder she did not commit, Wren is back to her life as a gifted Confectioner. She has a great, life, great friends, and even a great boyfriend who just happens to be a prince. However, Gifted are starting to go missing and soon the city is under siege. Moreover, when one of Wren’s newfound friends goes missing, Wren will stop at nothing and risk everything to figure out what is going on now. 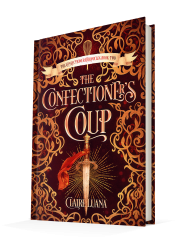 Published November 19, 2018, by Live Edge Publishing The Confectioner’s Coup by Claire Luana is the second novel in her YA fantasy Confectioner’s Chronicles that follows Wren on her most daring adventure yet.